Contributed by Benjamin Marks, Shinnyo-en Youth Association Member, Washington D.C.
Summers in the Nation’s Capital are always hot and steamy. However, that didn’t stop the members of Shinnyo-en Washington, D.C. from organizing a cool event! 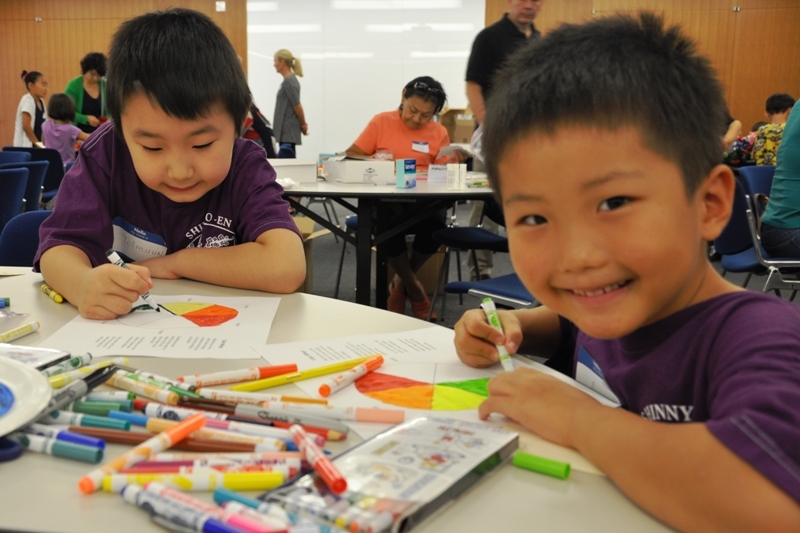 On August 30th, about 80 members and their families and friends gathered for a Family Afternoon of Service in the heart of historic Old Town Alexandria, on the banks of the Potomac River. 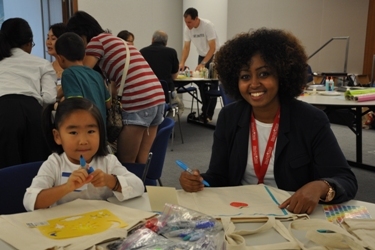 Shinnyo-en Foundation, in partnership with United Way Worldwide, sponsored the event at the Mary M. Gates Learning Center, which was named after Mary Gates, a passionate, well-known philanthropist — and mother of Bill Gates. 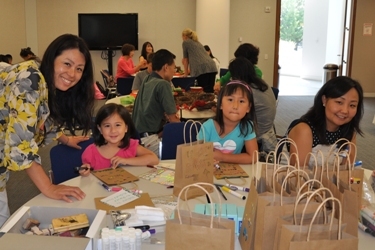 Several local community organizations were invited to participate and benefit from the event. The event began with opening remarks from Reverend Eitaro Hayashi of Shinnyo-en NY and Program Director Ineko Tsuchida from the Foundation, followed by introductions of each participating organization. Then, the participants spread out to different stations to participate in crafts and activities. 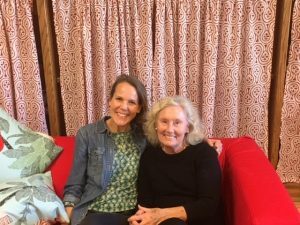 One of the participating organizations was Maddie’s Blankets, which started in 2007 when its founder, Maddie Pelgrim, was only ten years old. According to Maddie’s mother, Maddie started her own charity, which makes blankets for young children in foster care and for animals in shelters, because she was told she was too young to volunteer at other organizations. As of June, 2014, Maddie’s Blankets has made and donated over 13,000 blankets to those in need. Each organization had its own station for volunteers, young and old, to jump in and make donations: United Way Worldwide put together literacy kits and sorted hundreds of books for children living in the Alexandria Housing Authority; Carpenter’s Shelter wrote back-to-school letters and organized backpacks for the shelter’s 12 children; Martha’s Table decorated canvas bags for Martha’s Outfitters, a community thrift store that raises funds for programs as well as offers free clothing and housewares to those in need; Senior Services Alexandria decorated fall wreaths for seniors in their Friendly Visitor Program; Ronald McDonald House of Greater Washington, D.C. decorated brown bags stuffed with toiletry items to be used for the visiting families with children in hospital care; Maddie’s Blankets cut and tied fleece blankets for animals in shelters; and we put together math kits for students in Burundi, in care of Professor Elavie Ndura of George Mason University. 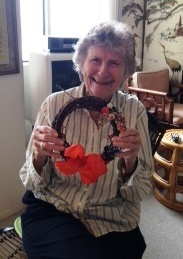 The wreaths that were decorated for Senior Services of Alexandria (SSA) went to seniors who live independently and are visited each week by SSA’s friendly volunteers. Since the event, the Foundation has received a letter of thanks, along with photos of happy seniors receiving their wreaths to decorate their rooms. After the crafts and projects were completed, everyone was treated to live music, thanks to superb performances by Ariel Chien (12) on viola, Lucinda Zhu (15) on violin, and Sean Shih (15), also playing the violin. The event ended with a slideshow presentation by George Mason University Professor, Elavie Ndura. Professor Ndura shared how she helps educate Burundian teachers with very limited resources on how to teach. Professor Ndura also shared some personal stories of growing up in Burundi, which is one of the five poorest countries in the world. She shared, “In the capital city, international aid is abundant, but in remote villages, the situation is different. In a remote village, a teacher must travel 60 miles to the nearest copy machine for teaching materials. Some have bicycles, but many travel on foot.” She also stressed that, “in areas of conflict, dialogue for peace is important. For dialogue, education is essential.” The audience had many questions afterwards and seemed to find the presentation very interesting and inspiring. Although this was the first Family Service Event in this area, it is unlikely to be the last. All those who participated, including the representatives of the community organizations, indicated that they would like to be part of more events like this in the future. The organizing and support team! 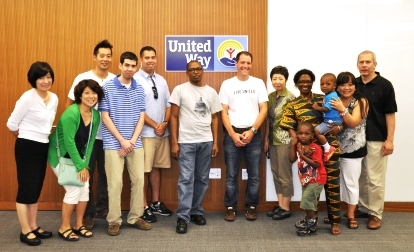 Benjamin Marks, fourth from the left in the above picture, is a member of the Shinnyo-en Youth Association. We thank him for not only contributing this article, but also for his involvement in planning the event and being the communications guy! We’d also like to thank all of those who brought donations of children’s books for United Way, as well as canned goods and food items for Martha’s Table.